Welcome to the Jack Lemmon Blogathon! Co-hosted by Crítica Retrô and Wide Screen World. Lemmon is perhaps best remembered for his comedic roles in classics like Some Like it Hot (1959) and The Apartment (1960). Of course, he was also unforgettable as a tragic alcoholic in Days of Wine and Roses (1962) and the deeply conflicted character in Save the Tiger (1973). Missing (1982) features one of his finest dramatic performances. 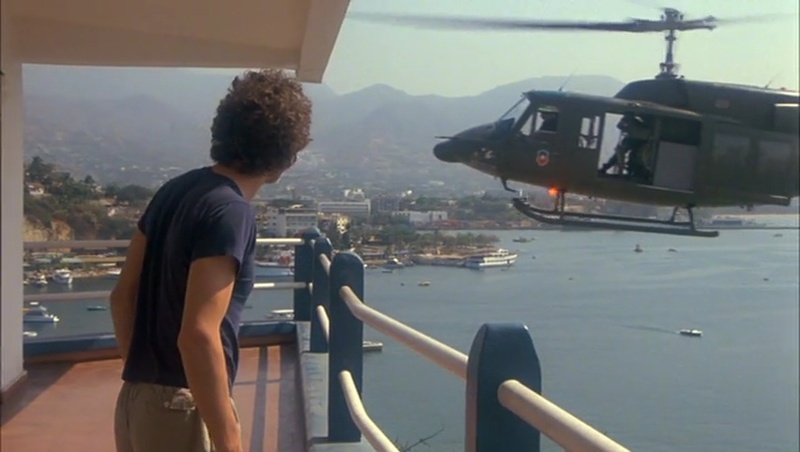 Directed by Costa-Gavras (Konstantinos Gavras), Missing was adapted from The Execution of Charles Horman: An American Sacrifice by Thomas Hauser. Lemmon plays Ed Horman, the father of a man who disappears in a Latin American country after a coup. As the film begins, two men and a woman ride in a car approaching a checkpoint. The driver, in civilian clothes, shows identification. The soldier waves them through with words of apology spoken in a heavy Spanish accent. The driver is Captain Ray Tower (Charles Cioffi), a U.S. official in the unnamed country. 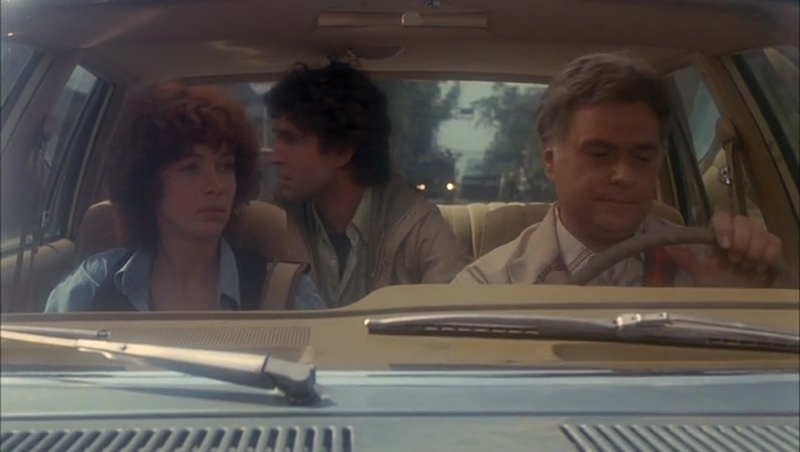 His passengers are Terry Simon (Melanie Mayron) and Charles Horman (John Shea) who’s in the back seat. The driver offers them a ride home. Charles tells him to drop them at a hotel. “Because I don’t want him to know where we live,” Charles tells Terry when she asks why he didn’t accept the ride. Charles and his wife Beth wanted their friend Terry to see picturesque Viña del Mar before returning to the states. 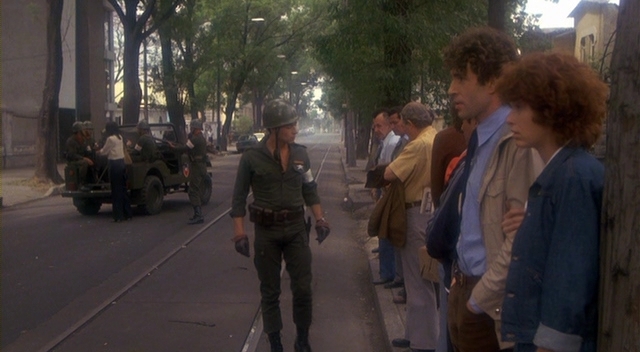 Then, the coup happened, leaving Beth (Sissy Spacek) stuck in the capital. Before Charles and Beth can reunite, Charles disappears. Neighbors saw soldiers taking him away. When Beth reports this to the American Embassy, they deny it and press the theory he’s in hiding because of his politics. Soon after the disappearance, Ed Horman (Lemmon) travels from his home in New York to Washington for answers. The politicians are sympathetic but can offer little concrete except for cables to the Ambassador. In the chance his son is still alive, Ed leaves behind his wife Elizabeth and flies to meet Beth. He soon learns the country is under martial law with soldiers patrolling the streets. The dangerous political climate concerns Ed, but he tries to keep up hope, visiting the local Christian Science Reading Room. 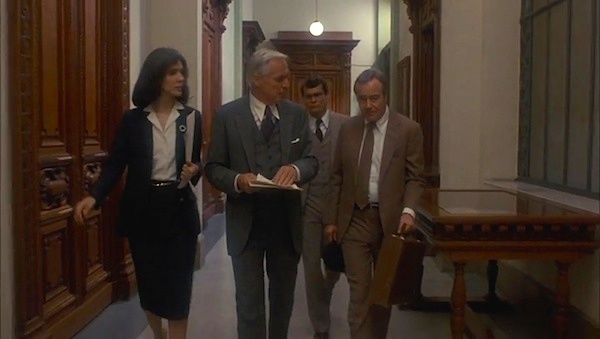 A patriot who voted for Richard Nixon, Ed wants to believe Consul Phil Putnam (David Clennon) and the Ambassador (Richard Venture) when they tell him they’re doing everything they can. Beth, who’s been getting the runaround, doesn’t hide her skepticism. Her anti-establishment attitude galls Ed. There’s a generational conflict between Beth and Ed as well as a political one. Charles and Beth supported the deposed administration. When Charles and Terry visited the seaside town, they may have seen and heard too much. Lemmon plays Ed as emotionally guarded even as he perseveres in his quest. With every gunshot and dead body in the street or in an overcrowded morgue, his certainty that the military killed Charles, increases. He and Spacek play off each other as their characters experience one setback after another. It’s draining and frustrating as they’re stonewalled by those who should by law protect them. Beth learns that some ambassadors are getting their nationals released from the stadium being used as a prison. Consul Putnam hesitates and makes excuses for not acting. When Ed and Beth are finally allowed into the stadium, they each address the crowd, identifying themselves and pleading for Charles to come forward. 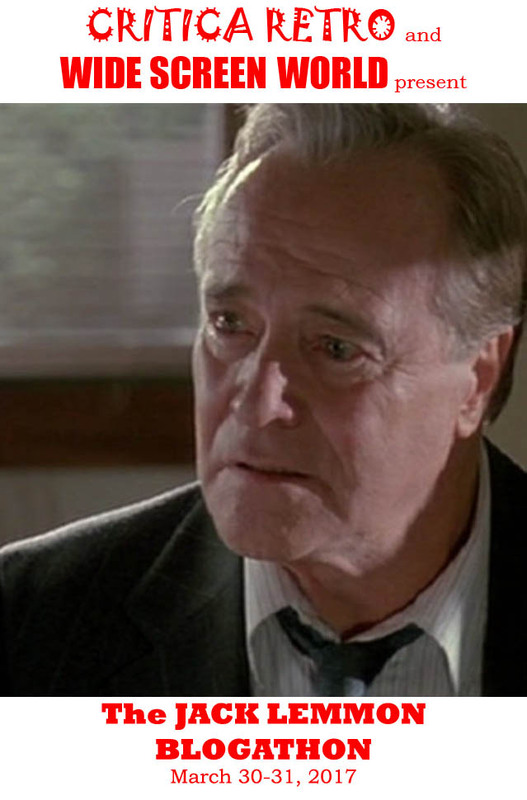 When I interviewed Chris Lemmon at the TCM Classic Film Festival about Missing, he revealed that his father was thinking of him when he played the scene. Chris didn’t learn this until years later. Costa-Gravas negotiated to use his French crew including editor Françoise Bonnot [Z (1969), The Confession (1970, State of Siege (1972)]. Argentinean Ricardo Aronovich, who worked extensively in France, was the cinematographer. Vangelis [Blade Runner (1982)] created the haunting electronic score. 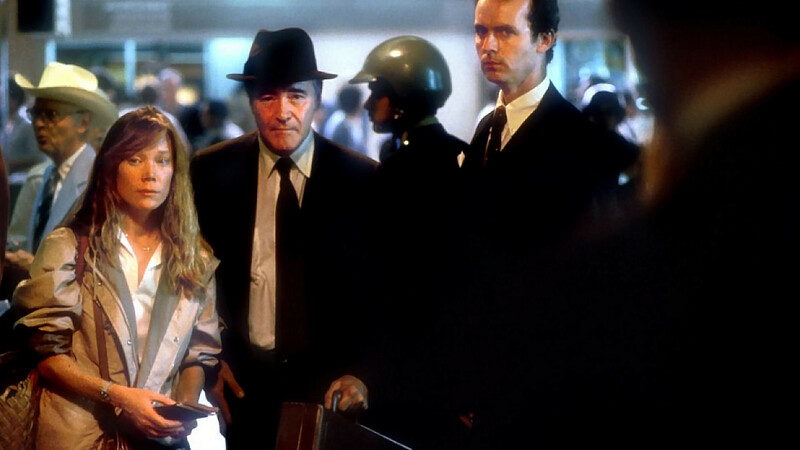 Missing won the Palme d’Or (Golden Palm) at the 1982 Cannes Film Festival where Lemmon was awarded Best Actor. Both Lemmon and Spacek were nominated for Academy Awards and the film was nominated for Best Picture. Costas-Gravas intentionally left out specific references to Chile to make the film more universal, he says. There were also legal issues to consider. He doesn’t mention Salvador Allende, the democratically elected President whose military assassinated or General Augusto Pinochet who led the Junta and orchestrated the reign of terror. Several U.S. officials sued the producers of Missing even though their names were changed or omitted from the movie. They eventually lost. Beth Horman’s real name is Joyce. She denied permission to use her name before she knew that Costa-Gavras would direct and make a film true to her experience. For more on the case visit Charles Horman Truth Foundation. The book by Thomas Hauser is highly recommended to give a fuller picture of the situation in Chile before, during and after Charles Horman’s disappearance. The Criterion DVD is also recommended for the pristine transfer and valuable extras. I was fortunate to see Patricio Guzman’s documentary The Battle of Chile when it screened at the San Francisco International Film Festival. It is now available on DVD.